Ume is a minor fruit crop of China. 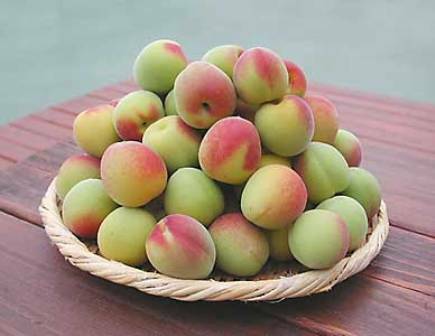 Though in many countries it is also Japanese apricot, but it is a native of China only. According ancient Chinese records, it is under cultivation there for the past 2200 years. But it is not grown mainly for fruits, but as a flowering tree, though the fruits are edible and used. But still, the fruits are just a bye product. 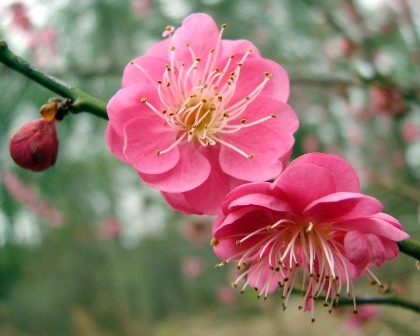 Ume has now been reached other parts of the world too because of its beautiful fragrant flowers. A small tree attaining a height of 5-10 m; spreading, round headed in shape and the size resembling the common apricot, but with grayish-green bark and green branchlets. 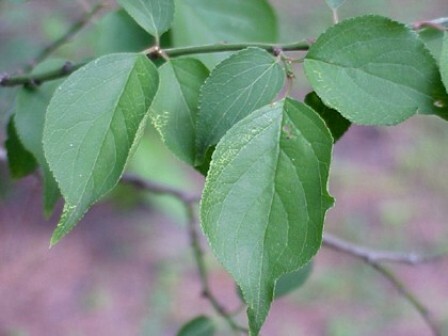 Leaves broad-ovate to ovate, 4-10 cm long, long acuminate, usually broad cuneate, finely and sharply serrate, and pubescent on both sides or only on the veins beneath; petioles glandular. Flowers large, light pink, usually double, handsome, fragrant and sessile. Fruits small, 3 cm in diameter, round, greenish or yellow; flesh firm, dry, acid and poor for eating fresh. Stone clung tightly to the flesh, small, ovate and pitted. Ume fruits are hard even when ripe and are sour too. So these are scarcely eaten fresh. These are, however, widely used in the Orient for pickling, as a condiment and also as a vegetable. Ume flowers are used as flavouring in tea. 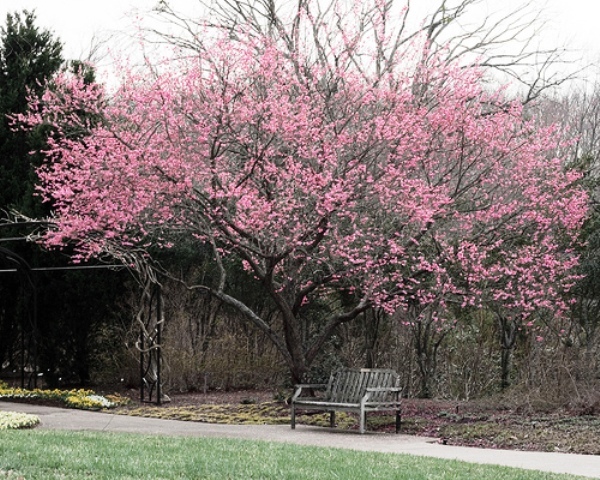 Ume can tolerate low temperature upto -15 C. It flowers earlier than its relatives and therefore is planted as a flowering tree too. This tree thrives in a well-drained moisture-retentive loamy soil, growing well on limestone and prefers a sunny position. Ume plants can be propagated from seed, softwood cuttings as well as grafting. There are several cultivars. The popularly grown cultivars in China are Dayie Zhunganmei (large leaved). It has large, round fruits weighing around 29 g each. The skin is yellowish-green with purple red blush on the sunny side; flesh fine, firm and used mostly for making salted fruits. Quality is very good. Other varieties grown in China are Ruanzhidalimei, Yanzhimei, and Zitimei.